The OXO Tot Fork and Spoon are perfect for when tots are ready to feed themselves. 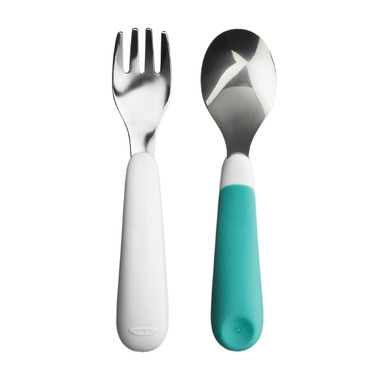 With generous handles that have soft, non-slip grips this durable stainless steel Fork and Spoon Set helps ease the transition to “grown-up” flatware. The perfect spoon and fork for a toddler. My favourite set for my toddler, good quality and just the right size for small hands to hold, easy to clean and store. I really like the size of the spoon for my 2 year old. She can hold them both really well! Perfect size and grip for my son. He's been using them since around 18 months old. He's almost 2 and we still prefer this set to others in the market. Great set for my 18m old, he loves feeding himself and this fork and spoon make it easy for him to do! My 20 month old really likes these! Good quality! I found the spoon is quite large to fit in my kid's mouth. 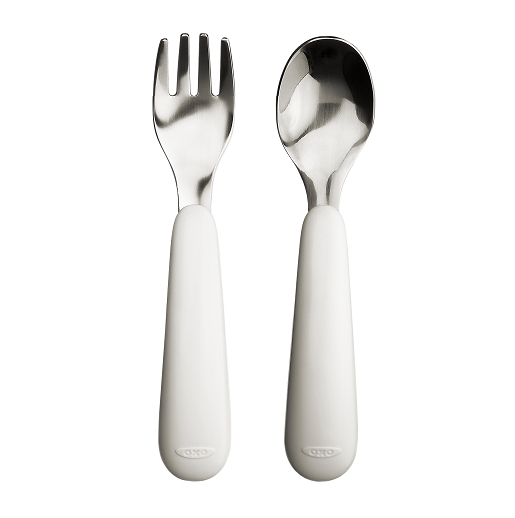 These are a good size, sturdy and the spoon is especially well-appointed, neither being too shallow not too wide. good set, which fits the small hands perfectly. Great set. They are slightly curved so its easy for little hands practicing with spoon & fork. My daughter was able to spoon soup into her mouth at 16/17 months. Easy to use for tiny toddler hands! Great size for small hands, nice 'bulk' to the handle to make gripping the utensil easier. High quality product! This set is perfect for little hands. We also tuck it in our diaper bag when we're going out and can use them wherever we are for lunch or dinner.